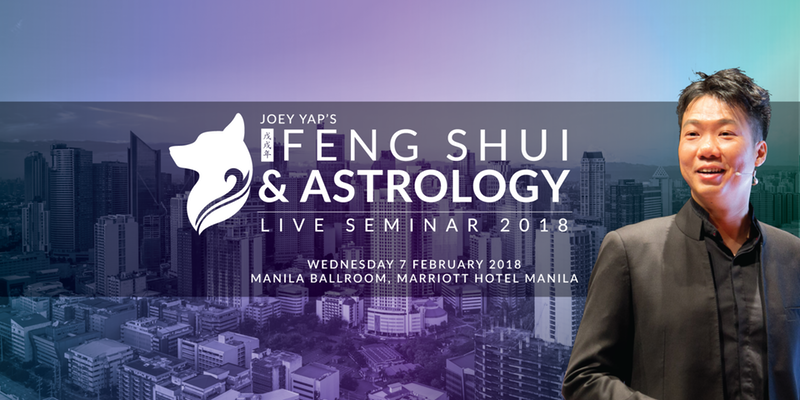 Dato' Joey Yap will be conducting the annual Feng Shui & Astrology (FSA) 2018 seminar LIVE in Manila on February 7, 2018 at the Manila Ballroom, Marriott Hotel Manila in Pasay City from 10:00am to 5:00pm. Get an outlook of 2018 and the opportunities hidden at curves and edges ahead. Featured on CNN, Bloomberg and CNBC, Joey is the world's leading authority in Feng Shui & Chinese Metaphysics. He speaks to more than 50,000 a year at his live events and is the bestselling author of 169 books. The Feng Shui & Astrology Seminar is an annual event that’s held in 12 major cities around the world, including London, New York, San Francisco, Florene, Frankfurt, Manila, Ho Chi Minh, Bangkok, Kuala Lumpur and Singapore. It’s a lot of fun. Nothing religious or mystical. It’s all about Classical Feng Shui & Chinese Metaphysics. Using Chinese Metaphysics as a tool, Joey shares tips and strategies that help you accelerate your career & business, transform your life & relationships and create a personal path towards success. The economic climate and the symptoms all point to one direction. In the Year of the Earth Dog (2018), expect to see challenges faced by the majority. It is also a time that you would expect empires to rise and new kings of the hill established. Statistics of all successful business empires, millionaires and game changers all made a head start during turbulent times. How the Earth Dog Year affects your personal BaZi Astrology Chart. What is the World’s Economic Outlook for 2018. What your 2018 personal forecast for Health, Wealth, Career & Relationships. What are the Auspicious Dates of 2018 and how you can use these dates strategically. Tickets range from $40-$450 based on your preferred package. Buy your tickets here.